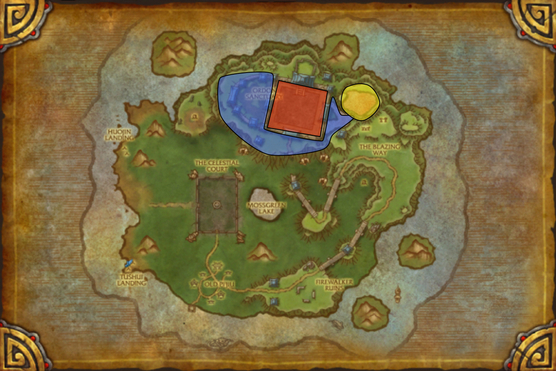 The Timeless Isle is an island off the coast of the Jade Forest. It was introduced with Patch 5.4 and, unlike areas usually added in patches, it features no questing hub and is only very loosely connected to the events of the patch it comes with. On the island, players will receive very limited guidance from NPCs and will have to discover most secrets by themselves or from reading guides such as the present one. 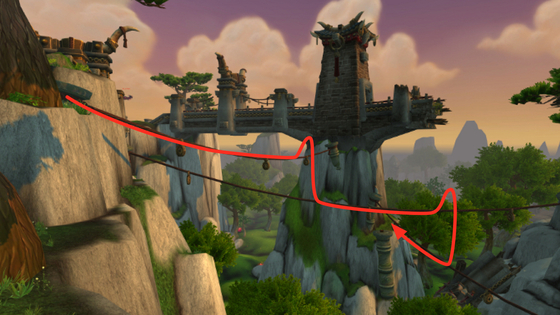 While the island plays a role in the last part of the Mists of Pandaria quest line, it has no direct relation to the Siege of Orgrimmar. That said, there is a quest line on the island that will give more lore information on the events that led to the siege. As we already said, there is no questing hub on the isle. After an initial quest line, your experience will be mostly self-directed and you will be able to freely do any of the following activities. Questing. 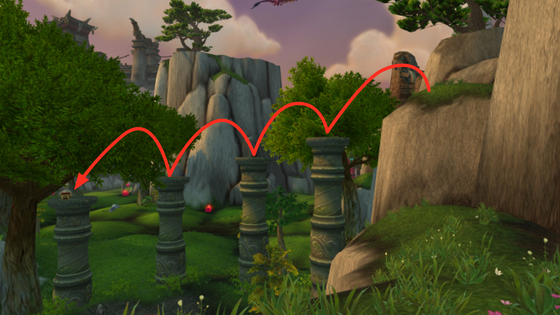 There are a few quest lines that take place on the island, including the last part of the Mists of Pandaria legendary quest line. There are also two daily and two weekly quests, and a cooking quest line that rewards you with the recipe for crafting a raid cauldron that provides +300 food to everyone in the raid. Raiding. 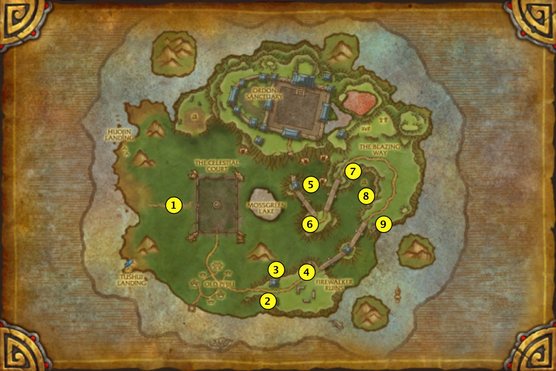 The five outdoor bosses of Patch 5.4 are located on the island. They are all part of the Mists of Pandaria legendary quest line. Chi-Ji, Niuzao, Xuen, and Yu'lon can be attempted by anyone grouping up with a player on the proper stage of the legendary quest line. Ordos can only be accessed by players who already obtained their legendary cloak. More details about this in our raid guides and our Breath of the Black Prince guide. Pet Battles. The island houses a pet battle tournament called the Celestial Tournament that you can complete once a week. Shaohao Reputation. Emperor Shaohao is a faction that you can earn reputation with by killing specific mobs on the island. Rare Elites. There are 31 rare elite mobs to kill on the island. Chests and Treasures. You will find many different types of chests and treasures on the island. They all contain loot or coins you can use to buy rewards. PvP and PvA. In addition to regular PvP, the island features a PvA system (Player versus All), in which you can fight against any player flagged for PvP, even members of your own party. You can discover mosts of the secrets of the island and complete most of the achievements on your first day, if you wish to do so. However, there are quests and events that will take a few weeks to complete. For example, the lore quest line requires you to complete a weekly quest several times and the Celestial Tournament will have to be won several times to buy all the rewards it has to offer. The island can be accessed by flying from the Jade Forest. Note that flying mounts do not work on the island, so you will be dismounted as you approach. While doing the introductory quest line for the island, you will be able to teleport there using the Curious Bronze Timepiece that you will have been given. As you can see in the map above, most of the island can be accessed without any difficulty. We highlighted 3 areas that will require you to perform something special, in order to reach them. Blue. As you can see on the map, the bridge leading to the Ordon Sanctuary is broken. As a result, you will need to resort to other means to enter this area. You can use the Gleaming Crane Statue, which is located on the rocky pillar that joins the bridge leaving from the Blazing Way to the broken bridge. Using the statue will catapult you in the air and you will be able to control your descent. 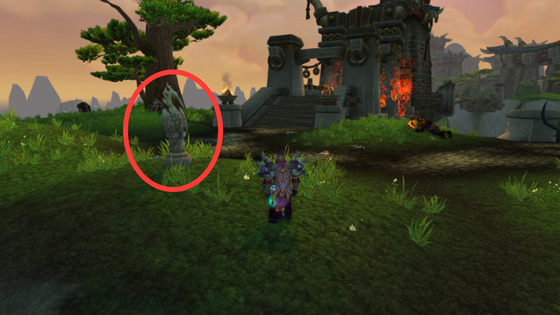 This statue is normally meant to be used to access a chest for one of the achievement, but you can reach the Ordon Sanctuary if you aim your descent towards it. From the very end of the broken bridge, it is possible to slow fall to a patch of grass, which is located slightly to the left of the remaining part of the bridge on the Ordon Sanctuary side. You need to mount and jump towards the patch of grass. Immediately after you jump, cast Slow Fall on yourself (or use any similar effect; the Golden Glider sold by Ku-Mo around the Celestial Court works well) or have it cast on you. The island features a number of Highwind Albatrosses that fly at varying altitudes. When one of them gets close to the ground (that usually happen around the Celestial Court), attacking it will cause it to capture you and fly you around the island, following a predefined path. When you want the Albatross to drop you, attack it again and it will stop moving. Kill it and it will release you. If you swim far enough from the island, you will reach the Time-Lost Waters. There, you can use your flying mount. So, go north of the island and mount up. Once mounted, go as far up as you can and then fly towards the Ordon Sanctuary. Eventually, you will dismount, which is when you should use a Slow Fall effect on you, in order to reach your objective. Note that this trick can work to reach any other high place on the island. Yellow. The Red Lake can only be accessed using an Albatross or the flying mount trick. We described both ways above. Red. 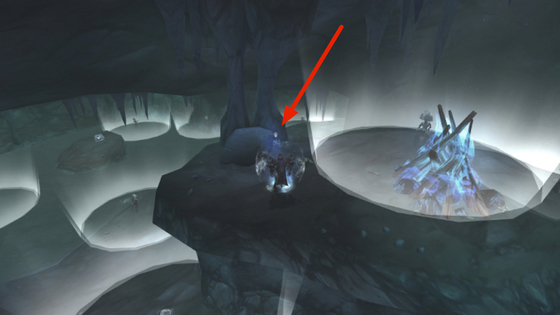 The central part of the Ordon Sanctuary can only be accessed by players who have completed the Mists of Pandaria legendary quest line and obtained the legendary cloak. Players without the cloak will simply be ported back to the Celestial Court, in the center of the island, when they try to enter the sanctuary. The only faction on the island is Emperor Shaohao and the only way to farm reputation with him is to kill Ordon mobs. There are 3 currencies that you can use on the island: Timeless Coins, Celestial Coins, and Bloody Coins. 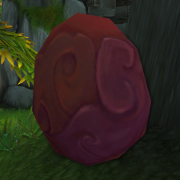 Timeless Coins are the primary currency on the Timeless Isle. Every mob, quest, chest, and object on the island will grant you some. There is no limitation to how many coins you can earn in a single day or a single week, so you can farm them to your heart's content. Timeless Coins can be used to buy rewards (see next section). Celestial Coins are related to the Celestial Tournament, a weekly pet-battle scenario you can do on the island that rewards you with 1 Celestial Coin. These coins can be used to buy pet-battle related rewards. Bloody Coins are obtained by doing PvP and PvA on the island. Each time you kill another player, you will be awarded 1 Bloody Coin. After collecting enough coins, you will be able to buy rewards from Speaker Gulan. 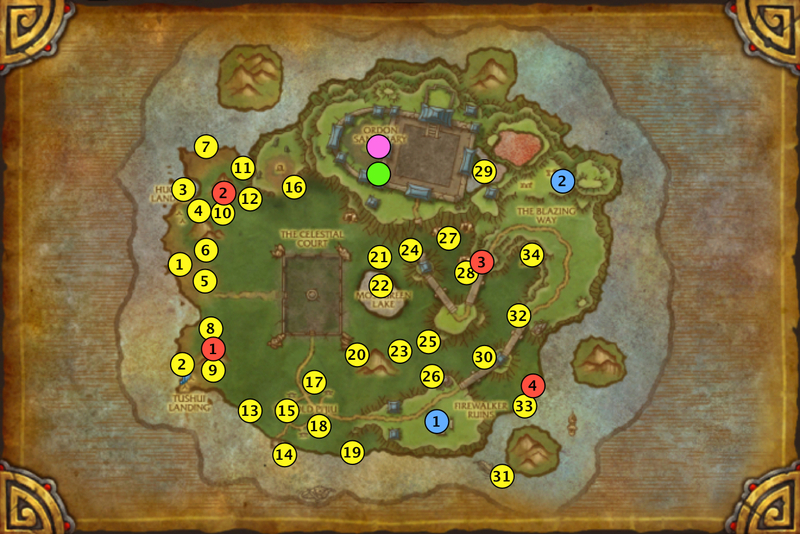 The Timeless Isle offers numerous rewards that we will try to list exhaustively here. 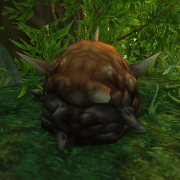 Harmonious Porcupette Sold by Mistweaver Ku for 7,500x Timeless Coins. Requires revered reputation with Emperor Shaohao. Dandelion Frolicker Click the Neverending Spritewood near 47.5, 73.5. This will turn the nearby Nice Sprites into Angry Sprites. Killing many of these Angry Sprites will spawn a Scary Sprite, which you can kill for the pet. Note that you can use the Neverending Spritewood only once per day and after someone has used it, you need to wait for it to respawn. Reins of the Heavenly Golden Cloud Serpent Sold by Mistweaver Ku for 100,000 Timeless Coins. Requires exalted reputation with Emperor Shaohao. 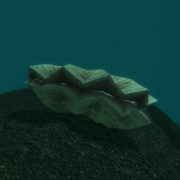 Mobs on the island have a chance to drop Timeless pieces of gear, such as Timeless Plate Spaulders. Using such an item creates a corresponding item level 496 piece of gear that your current spec can use. There are timeless items for every slot, excluding weapons. In addition, Mistweaver Ai sells Timeless Cloth Armor Cache, Timeless Leather Armor Cache, Timeless Mail Armor Cache, and Timeless Plate Armor Cache for 7,500 Timeless Coins each. All these timeless items are account-bound, which means that they are a great way to gear up an alt. it is sold by Mistweaver Ai for 50,000 Timeless Coins. Gear can also be bought with Timeless Coins from Mistweaver Ai and with Bloody Coins from Speaker Gulan. * requires honored reputation with Emperor Shaohao. Many vendors around the Celestial Court sell various items that you may find interesting. * requires friendly reputation with Emperor Shaohao. ** requires honored reputation with Emperor Shaohao. In addition, vendors around the Celestial Court sell food, drinks, fireworks, etc. 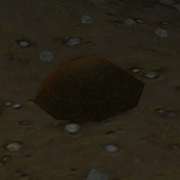 Finally, there are dozens of vanity items that can be dropped by mobs around the island. Obtaining them all will grant you the Going To Need A Bigger Bag achievement. So, you can simply click the achievement link and browse the achievement's objectives on WowDB to have a complete list. 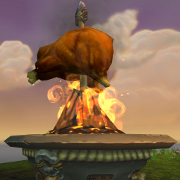 The Noodle Secrets Long Forgotten cooking quest line starts on the Timeless Isle. Eventually, that quest line rewards you with the ability to create Noodle Cart Kit, Deluxe Noodle Cart Kit, and Pandaren Treasure Noodle Cart Kit, which give better raid food buffs than pandaren banquets. When a player creates a noodle cart, it acts like a vehicle and exiting it causes the cart to disappear (it disappears anyway after a few minutes). Each player can hold a maximum of 5 noodle soups (which means that they can store some food for later use). There are many buffs you can get on the island, which are very helpful. Timeless Nutriment is given by a number of objects on the island: Ripe Crispfruit, Sand-Covered Egg, Charged Crystal, Huge Yak Roast, Roasted Seed, Fire Poppy, Southsea Firebrew. To help you identify them, we made screenshots of them and shared these screenshots below. Two of these objects give an additional buff when you right-click them. 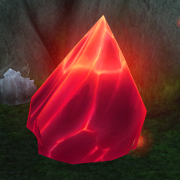 Charged Crystals give you Strange Energy, while Fire Poppies give you Smoldering Spores (which is very useful when farming mobs outside the Ordon Sanctuary). Mobs on the island have a chance to drop these three items: Dew of Eternal Morning, Book of the Ages, and Singing Crystal. Using them causes your damage dealing abilities to have an extra effect. These items are also rewarded by Path of the Mistwalker daily quest. There are many Time-Lost Shrines located around the island. Right-clicking them will grant you a random buff from among: Fortitude of Niuzao, Wisdom of Yu'lon, Chi-Ji's Hope, and Xuen's Strength. Obtaining all these buffs (not necessarily at the same time) will grant you the Pilgrimage achievement. Instead of granting you a buff, a shrine will sometimes deal a high amount of damage to nearby enemies because it will have been corrupted by Ordos (although there is no way to tell prior to clicking the shrine). Shrines become inactive for a bit after a player interacts with them, meaning that no one else will be able to get a buff from that shrine until it reactivates. The map above shows all the locations of all the Time-Lost Shrines we have found. We will update the map, if we find more. Below, you will find the exact coordinates of the shrines. 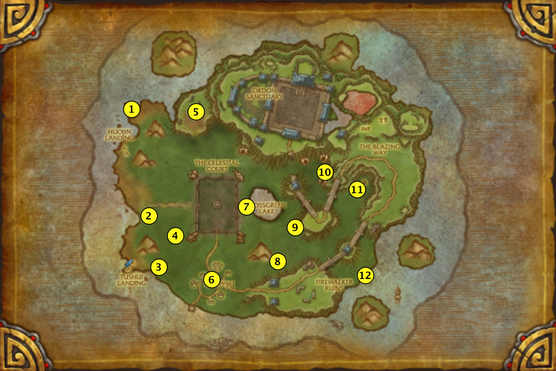 A short introductory quest line leads to the Timeless Isle. It starts with A Flash of Bronze... ( Alliance / Horde), which is automatically given to level 90 characters in the Vale of Eternal Blossoms. The quest line continues with Journey to the Timeless Isle ( Alliance / Horde) and then with Time Keeper Kairoz ( Alliance / Horde). At this stage, Kairoz will give you two quests A Timeless Tour and Time In Your Hands. A Timeless Tour leads to Hints From The Past, followed by Timeless Treasures (opening any chest works for completing this quest), and Strong Enough To Survive (a weekly quest). Time In Your Hands opens up two new quests, each starting a different quest line. The Essence of Time starts a quest line with Kairoz that will take you several weeks to complete. The Last Emperor starts a quest line with Emperor Shaohao that you can complete in a single day. The Essence of Time leads to Empowering the Hourglass. This weekly quest requires you to gather 50 Epoch Stones by killing mobs around the island. We advise you to farm them from Great Turtle Hatchlings on the western coast. One Final Turn: Caverns of Time. One Final Turn marks the end of the quest line. The cooking quest line starts when you find an Old Sign Fragment under the broken bridge on the Timeless Isle (at 52.14, 46.15 to be precise). This item starts the Noodle Secrets Long Forgotten quest, which is followed by The Lost Secret of the Secret Ingredient. The Lost Secret of the Secret Ingredient requires you to go to the Temple of the Jade Serpent and kill the Sha of Doubt. After killing the Sha, do not exit the instance, because you need to turn in the quest to the scroll in the same room as the Sha. Also, try to get the tank to stay with you, because the next quest, Bad Feeling, Worse Result, requires you to kill an elite mob on the balcony at the end of the room where you fought the Sha of Doubt. To defeat this mob, just avoid all things thrown at you. After completing Secrets Lost, Forever?, you will receive Secrets Lost, Forever?, which is followed by Catch and Carry. Catch and Carry rewards you with the ability of making Noodle Cart Kit and requires you to do the following. Go to the Imperial Granary. There, you will notice a cart with a downward pointing arrow above it. This is where you will need to drop the sacks of grain. At the granary, there are Granary Vandals throwing down sacks of grain. Get under them and use the Grain Catching Sack quest item that you were provided with, and catch sacks by position yourself under them as they fall. The quest item gives you a buff that allows you to catch the sacks. Without the buff, you just get damage when a sack lands on you. You can only carry 5 stacks of grain at a time and mounting, taking damage, or using a spell will cause you to lose your stacks. Because of that, you may want to clear the path back to the cart before getting started. The next quest is Is That A Real Measurement?. 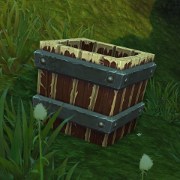 It requires you to craft a Noodle Cart Kit and to enter the Stormstout Brewery to collect 20 Sloshes of Brew from the Alementals, who are all located before the last boss. After that, you will have to complete These Aren't Your Fatty Goatsteaks. This quest requires you to craft a Deluxe Noodle Cart Kit and to farm 50 Fatty Turtle Steaks from the turtles on the Timeless Isle. Killing Great Turtle Hatchlings seems to be the most efficient way of gathering these steaks. 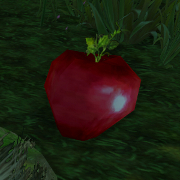 The final quest of the quest line is The Secret Ingredient Is.... Simply enter the scenario and follow the instruction. You will be rewarded with the ability to create Pandaren Treasure Noodle Cart Kit. There are two daily quests on the island. Path of the Mistwalker is unlocked as part of the Emperor Shaohao quest line. As we have said before, the best way to do this quest is to kill easy elite mobs, such as Brilliant Windfeathers and Great Turtles. It rewards a buff item, 50x , and 1,000 Timeless Coins. A Timeless Question is a daily quest given by Senior Historian Evelyna. It rewards 100 Timeless Coins and requires you to answer a lore-related question. Below, you will find the list of questions and their answers. Tell me, hero, what are undead murlocs called? The Ironforge library features a replica of an unusually large ram's skeleton. What was the name of this legendary ram? Who was the first death knight to be created on Azeroth? In Taur-ahe, the language of the tauren, what does lar'korwi mean? Not long ago, this frail Zandalari troll sought tot ame a direhorn. Although he journeyed to the Isle of Giants he was slain in his quest. What was his name? Succubus demons revel in causing anguish, and they serve the Legion by conducting nightmarish interrogations. What species is the succubus? Before she was raised from the dead by Arthas to serve the Scourge, Sindragosa was a part of what dragonflight? Name the titan lore-keeper who was a member of the elite Pantheon. This emissary of the Horde felt that Silvermoon City was a little too bright and clean. Malfurion Stormrage helped found this group, which is the primary druidic organization of Azeroth. Formerly a healthy paladin, this draenei fell ill after fighting the Burning Legion and becoming one of the Broken. He later became a powerful shaman. 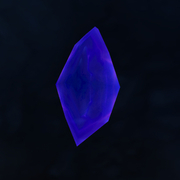 Name the homeworld of the ethereals. Before Ripsnarl became a worgen, he had a family. What was his wife's name? What is the highest rank bestowed on a druid? While working as a tutor, Stalvan Mistmantle became obsessed with one of this students, a young woman named Tilloa. What was the name of her younger brother? Thane Kurdran Wildhammer recently suffered a tragic loss when his valiant gryphon was killed in a fire. What was this gryphon's name? One name for this loa is "Night's Friend". What evidence drove Prince Arthas to slaughter the people of Stratholme during the Third War? Who was the first satyr to be created? 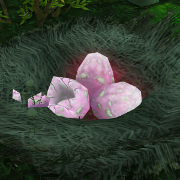 Who were the three young twilight drakes guarding twilight dragon eggs in the Obsidian Sanctum? This queen oversaw the evacuation of her people after the Cataclysm struck and the Forsaken attacked her nation. This defender of the Scarlet Crusade was killed while slaying the dreadlord Beltheris. White wolves were once the favored mounts of which orc clan? What is the name of Tirion Fordring's gray stallion? What did the Dragon Aspects give the night elves after the War of the Ancients? Brown-skinned orcs first began showing up on Azeroth several years after the Third War, when the Dark Portal was reactivated. What are these orcs called? Who is the current leader of the gnomish people? This structure, located in Zangarmarsh, was control by naga who sought to drain a precious and limited resource: the water of Outland. What phrase means "Thank you" in Draconic, the language of dragons? Which of these is the correct name for King Varian Wrynn's first wife? Arthas's death knights were trained in a floating citadel that was taken by force when many of them rebelled against the Lich King. What was the fortress's name? Who was the mighty proto-dragon captured by Loken and transformed into Razorscale? Before the original Horde formed, a highly contagious sickness began spreading rapidly among the orcs. What did the orcs call it? Whose tomb includes the inscription "May the bloodied crown stay lost and forgotten"? In the assault on Icecrown, Horde forces dishonorably attacked Alliance soldiers who were busy fighting the Scourge and trying to capture this gate. The draenei like to joke that in the language of the naaru, the word Exodar has this meaning. This Horde ship was crafted by goblins. Originally intended to bring Thrall and Aggra to the Maelstrom, the ship was destroyed in a surprise attack by the Alliance. Strong Enough To Survive and Empowering the Hourglass are the two weekly quests that you can do on the island. They are both unlocked by doing Kairoz' quests. Strong Enough To Survive rewards 1,000 Timeless Coins, while Empowering the Hourglass rewards 200x and 1,000 Timeless Coins. Pristine Firestorm Egg: 500 Timeless Coins. 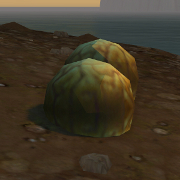 Rolo's Riddle can be found in Glinting Sands or looted from random mobs across the Timeless Isle. This item starts a short quest line. Rolo's Riddle - first part. Go to 49.37, 69.42. The 4 tall men refer to the 4 columns. Rolo's Riddle - second part. Go to the statue of Chi-Ji on the northwestern corner of the Celestial Court (Chi-Ji is what hope with wing held forth refers to). Then, go north, pass the gate, keep going north until you find the mound of dirt with the question mark. Rolo's Riddle - third part. Take an Albatross to go to the red lake (east of the Ordon Sanctuary). The treasure is by the tree overlooking the lake. Completing this quest line will grant you the Rolo's Riddle. The Celestial Tournament is a pet battle quest that you can only do once per week and per account. 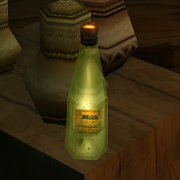 It is given by Master Li on the Timeless Isle. To complete the quest, you need to enter a scenario where you will have to fight and defeat 3 random trainers from the 13 that are present in the scenario. While in the scenario, you cannot heal or resurrect pets. Completing the scenario grants the The Celestial Tournament achievement. Defeating all 13 trainers grants you the Master of the Masters achievement. Completing the quest rewards you with 1 Celestial Coin, which you can use to buy rewards from Master Li. Using your Celestial Coins to buy all 4 Celestial Pets grants you the Celestial Family achievement. Aside from a few quests from Emperor Shaohao (including the Path of the Mistwalker daily quest, which rewards +250 reputation), reputation with him is earned solely through killing Ordos mobs on the island. Gaining reputation with Shaohao unlocks many rewards, as listed here. In this section, we are going to list the raw reputation given by each mob (without counting reputation bonuses) before explaining the fastest ways to farm reputation. If you are alone, you are better off farming in the Firewalker Ruins or restricting yourself to the Burning Berserkers in the Blazing Way. If you are in a party, then you should farm reputation outside the Ordon Sanctuary. 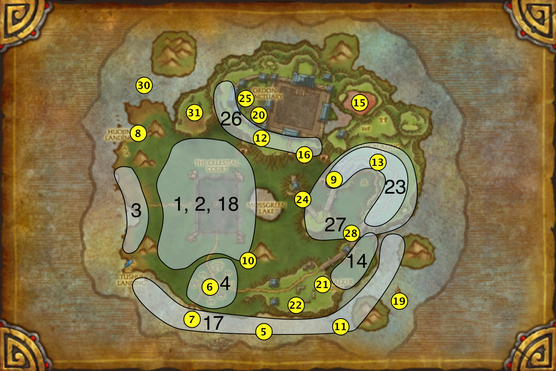 Simple sweep the area back and forth (including the western part of the Ordon Sanctuary, which is accessible to everyone). When you die, run to your corpse, otherwise you may have to aggro a lot of mobs on your way back to your group. Reaching exalted reputation with Emperor Shaohao will grant you the Emperor Shaohao achievement. Emerald Gander spawns at various locations around the Celestial Court. Ironfur Steelhorn spawns at various locations around the Celestial Court. Great Turtle Furyshell patrols among the turtles on the western shore of the island. Gu'chi the Swarmbringer spawns around Old Pi'Jiu. Zesqua spawns off the coast of Pi'Jiu, slightly to the east. Zhu-Gon the Sour spawns at 37.55, 77.31 after completing the Skunky Beer mini-event at the same location. Karkanos is summoned by talking to Fin Longpaw at 34.08, 83.84. Chelon spawns after you inspect the shell at 25.06, 35.98. Spelurk can be summoned by breaking the cave-in of the Mysterious Den at 59.0, 48.8. You can break the cave-in by using the new action button you get from finding and opening the objects of Timeless Legends. Alternatively, a Mage with Blink can teleport to the other side of the wall and use the hammer inside the cave to destroy the wall. Cranegnasher needs to be summoned. At 43.89, 69.89, you will find the corpse of a dead Fishgorged Crane. Inspecting the corpse indicates that these cranes are the favorite food of a creature. This means that you need to kite a live Fishgorged Crane onto the corpse to summon Cranegnasher (you will find these ads just south of the corpse). Rattleskew spawns after you complete the Battle of the Barnacle mini-event at 60.67, 87.91. Spirit of Jadefire spawns inside the Caverns of Lost Spirits in the recess on the right, almost facing Zarhym. Leafmender spawns in the Blazing Way, around the tree at 67, 43. Bufo spawns in the area filled with Gulp Frogs around 65,65. Garnia spawns in the Red Lake. Tsavo'ka spawns in Tsavoka's Den at 54.09, 42.40. Monstrous Spineclaw patrols underwater, off the southern coast of the island. Imperial Python spawns in various locations around the Celestial Court. Stinkbraid spawns at 71.58, 81.85, on the deck of the pirate ship. Rock Moss spawns at the bottom of the Cavern of Lost Spirits. Watcher Osu spawns in the Firewalker Ruins. Jakur of Ordon spawns in the Firewalker Ruins. Champion of the Black Flame are three adds that patrol between the two bridges of the Blazing Way. Cinderfall spawns on the broken bridge. Urdur the Cauterizer spawns in the western court of the Ordon Sanctuary. Flintlord Gairan spawns at various locations around the Ordon Sanctuary. Huolon flies around the Blazing Way and the Firewalker Ruins. Golganarr spawns around 62.5, 63.5. Evermaw is not marked on the map because she swims clockwise around the island. Dread Ship Vazuvius spawns around 28.8, 24.5. 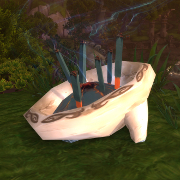 It needs to be summoned at the nearby beach with the Mist-Filled Spirit Lantern that drops from Evermaw. Archiereus of Flame spawns inside the Ordon Sanctuary, so players who do not have the legendary cloak will need to use a Scroll of Challenge at the Challenger's Stone (34.4, 32.5). Scrolls of Challenge are sold by Mistweaver Ku for 500 Timeless Coins, if you are at least honored with Emperor Shaohao. Rare elites and mini-events that spawn them appear on your mini-map. There is no need to tag them to loot them. For most of them, their health increases as more players join the fight. Killing all the rare elites grants the Timeless Champion achievement. In this section, we will present all the chests and treasures you can find on the island. Since they are all linked to a specific achievement, we will simply tell you how to complete each achievement. 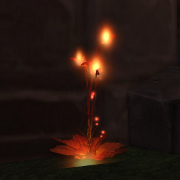 Fiery Altar of Ordos, found around the Ordon Sanctuary. To make it easier for you to identify these objects, we took screenshots. Treasure, Treasure Everywhere requires you to open a number of chests around the island. To make it easy for you to find them, we made the following map, under which we list additional information for finding the chests. Where There's Pirates, There's Booty requires you to find 3 objects: Sunken Treasure, Blackguard's Jetsam, and Gleaming Treasure Satchel. Note that you can loot each of these objects once a week and that they appear on your mini-map. Sunken Treasure is located inside the sunken ship at 40.0, 94.5. To open it, you will need a Barnacle Encrusted Key, which you can loot from one of the nearby Cursed Hozen Swabbies. Inside, you will find a Cursed Swabby Helmet, among other things. Blackguard's Jetsam is guarded by a few hostile pirates inside an underwater cave, the entrance of which is located at 17.07, 57.09. Gleaming Treasure Satchel is located on the pirate ship at 71.60, 82.91. To reach it, you will need to jump on the ropes, as shown in the screenshot below. Extreme Treasure Hunter requires you to loot 3 chests: Gleaming Treasure Chest, Rope-Bound Treasure Chest, and Mist-Covered Treasure Chest. Note that you can open each of these objects once a week and that they appear on your mini-map. To reach the Gleaming Treasure Chest, which is located at 49.68, 69.41, you need to jump from column to column from the Firewalker Ruins, as depicted in the screenshot below. 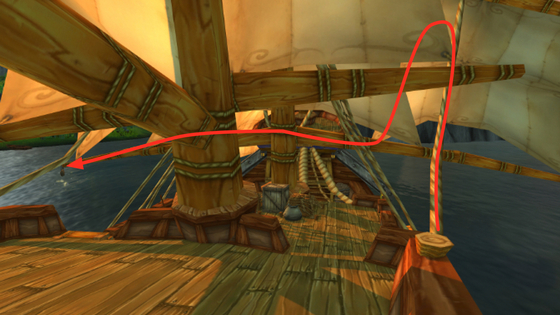 To reach the Rope-Bound Treasure Chest, which is located at 53.87, 47.34, you need to jump from rope from the Blazing Way, as depicted in the screenshot below. Players can also use a Golden Glider to get there and Mages can use Blink. To reach a Mist-Covered Treasure Chest, you need to use the Gleaming Crane Statue (pictured below), which is located on the stone pillar joining the bridge that leaves from the Blazing Way to the broken bridge. Doing so will throw you in the air (you can control your fall) and you will immediately notice the many platforms around you. Simply choose one with a chest, land on it, and open it. There are four objects on the island that share spawning points: Cloudstrike Family Helm, Flameheart Shawl, Riverspeaker's Trident, and Snowdrift Tiger Talons. Finding one of them will grant you the Legend of the Past achievement, while finding all of them will grant you the Timeless Legends achievement. So far, we know of 9 spawning points, some we found ourselves, others were reported on Wowhead. The map below shows you where to find the legends. You will find coordinates after the map. When you right-click one of these objects, it gives you a buff that remains for 10 minutes. We chose not to list these buffs in the buffs section, because the objects are so rare that you will very rarely benefit from their corresponding buff. Cloudstrike Family Helm gives Cloudstrike. Flameheart Shawl gives Flameheart Shawl. Snowdrift Tiger Talons gives Snowclaw. These buffs grant you a new action button that you can use during combat to kill mobs faster, but you can also use them to break the cave-in at the Mysterious Den (see explanations for Spelurk). In one of the caves near the broken bridge, you will find Master Kukuru. If you pay him 500 Timeless Coins, he will give you a key with which you can use to open any of the chests in his cave. Each chest has a chance to give you, in average, 400 Timeless Coins, or a piece of Timeless gear. So, farming these chests is a very efficient way to get gear for an alt, without spending too many coins. You also have a low chance of getting a Burden of Eternity when opening Kukuru's chests. After buying a Censer of Eternal Agony from Speaker Gulan and using it, you will be able to attack any player flagged for PvP, earning 1 Bloody Coin for every kill you make while the 1-hour buff given by the censer is active (it does not persist through death). The first time you use the censer, you will earn the Emissary of Ordos achievement. Note that you cannot farm the same player all over again for Bloody Coins, as, upon death, they get a debuff that prevents them from granting Bloody Coins again for 10 minutes. After collecting 50 Bloody Coins, you will be able to buy a Fire-Watcher's Oath, which makes it possible to collect Bloody Coins while doing regular PvP (World PvP or Battlegrounds). By collecting enough coins, you will eventually earn the following achievements: Candlekeeper, Oathguard, Blazebinder, Kilnmaster, and Fire-Watcher. All of the achievements have already been explained in the guide, except for Killing Time, Going To Need A Bigger Bag, and Zarhym Altogether. Killing Time is very easy, as none of the mobs you need to kill is hidden or hard to find. You simply need to explore the isle thoroughly. Going To Need A Bigger Bag is probably the hardest achievement of them all. It requires you to obtain dozens of items from mobs or chests on the island and will demand a lot of patience. To complete Zarhym Altogether, you need to help Zarhym find his body. He is located on the right, as you enter the Cavern of Lost Spirits. After talking to him, you will be sent to a spirit realm, where you have 5 minutes to find Zarhym's body, which is located in the room that is the furthest away from the entrance of the cave (see screenshot below for specific location of Zarhym). In order to make your way there, you will need to avoid many spirits. They are all surrounded by a beam of light. Entering it will cause them to detect you and remove you from the spirit realm. Should you fail your assignment (by taking too long or by being spotted by a spirit), then you will not be able to try again before the next day. 02 Mar. 2014: Added that Kukuru's chests can give a Burden of Eternity. 04 Feb. 2014: Added a mention of the Path of the Mistwalker daily quest in the Shaohao reputation section. 04 Dec. 2013: Added reputation requirements for Emperor Shaohao items. 04 Oct. 2013: Various fixes from comments on forums. 14 Sep. 2013: Timeless items can be used to create trinkets. Explanations for gaining access to the Mysterious Den have been linked at relevant places of the guide. 12 Sep. 2013: Explained how to break the cave-in that prevents access to the Mysterious Den.